Bunhill Fields Dissenters' Burial Ground in the borough of Islington, London, was established in 1665 near Bunhill Fields, an open area of fen outside the ancient walls of the City of London. 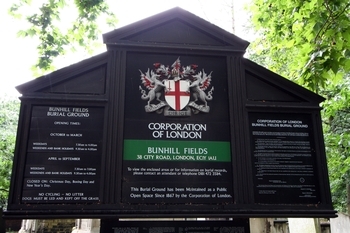 The name Bunhill derives from Bonehill, a popular name given a much older burial place in the vicinity. As unconsecrated ground, this became the last resting place for many London people who were Quaker or Non-Conformist, Protestant but not belonging to the established Church of England. These included John Bunyan, Daniel Defoe, William Blake, Isaac Watts, and many other notable people. "My body I comit to the earth to be buried privately by or near Colonel Mathew Shepperd in the new ground near Bunhill..."
Many headstones at Bunhill are badly eroded, their inscriptions illegible or almost illegible. Bunhill Fields Graveyard records are held at Guildhall Library Manuscripts Section. These are also available on microfilm at London Metropolitan Archives. Ms.897/9 is a plan of the burial ground in 1869 showing sites of inscriptions visible at the time. This does not represent the burial ground as it is now, many gravestones having been moved since 1869. Ms.389/87 includes plans of the location and sections from 1973 showing sites of gravestones and the surnames on the monuments. 1. 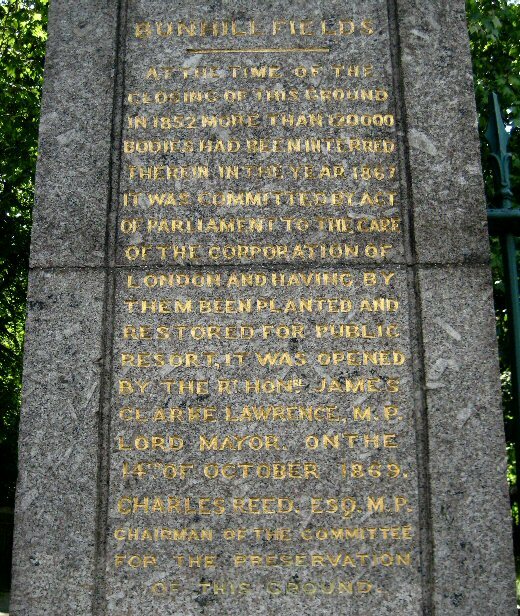 "Bunhill Memorials: Sacred Reminiscences of Three Hundred Ministers and other persons of note, who are buried in Bunhill Fields, of every denomination. With the inscriptions on their Tombs and Gravestones, and other historical information respecting them, from authentic sources", Edited by J. A. Jones, 1849. 2. Several MS. volumes of Epitaphs of persons buried at Bunhill Fields between 1665 and 1794, collected by Rev. Dr. John Rippon in the early 19th century, are in the library of the College of Arms. These are on microfilm at London Metropolitan archives. 3. "Epitaphs: Quaint, Curious, and Elegant" by Henry James Loaring, pub. 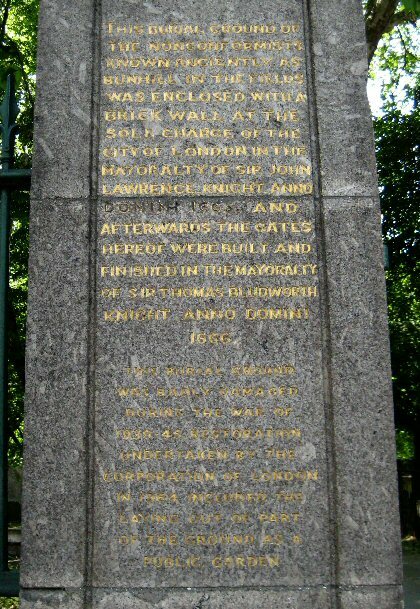 1873 by William Tegg, London, in the chapter "Elegant Epitaphs", p.65, contains, under: "Inscriptions on tombs in the Dissenters' Burial-place, near Bunhill Fields"
and of Christian and English Liberties. Obiit 6o Jan. 1699. AEtate 76. In Hope of the Resurrection of the Just. On a Grave-stone adorned with Warlike Trophies, is this Inscription. The same Appendix lists a few other headstones in the immediate vicinity of of William Blennerhassett's stone. "On a Grave-stone, near the Artillery-Ground Wall, is this Inscription." Mar. 13. A. S. 1710. A. "On a Grave-stone adorned with Warlike Trophies, is this Inscription." "On a Grave-stone, next the former, is this Inscription." 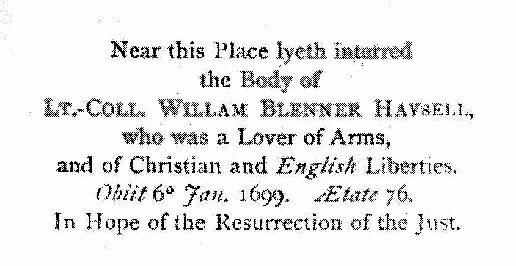 Here lyes interred the Body of Mr.
1694. in the 38th Year of his Age. Hell, where's thy Triumph ? Death, where is thy Sting ? "On a Grave-stone, near the former, is this Inscription."